Intercontinental Hotels Group will open a dual Crowne Plaza / Staybridge Suites development in Manchester towards the end of next year. 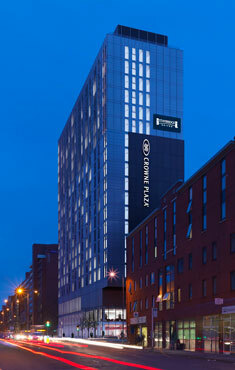 The 210-room Crowne Plaza Manchester – Oxford Road and 116-room Staybridge Suites Manchester – Oxford Road are being built as part of Manchester University’s £1 billion campus development. The Staybridge Suites will feature a 24-hour business centre, fitness room, laundry room, free wifi and a 24-hour convenience store. The two hotels, which will adjoin Manchester Business School’s new two-storey Executive Education Centre, will take the number of IHG properties in Manchester to 21. Philip Lassman, IHG’s director of development for the UK & Ireland, said: “Manchester is a key city for us and it’s great to see an appetite for our extended stay brand Staybridge Suites here. Both hotels will operate under a franchise agreement with M&L Hospitality and will be managed by Cycas Hospitality. IHG opened its second Staybridge Suites in London earlier this year (see news, January 29).